Pre-nups go far beyond contemplating if divorce might one day be in your future. 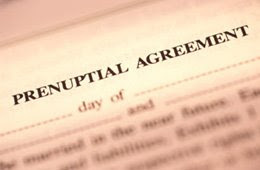 While generally pre-nups are considered in terms of possibly breaking up, there is much more to consider when choosing whether or not to enter into a prenuptial agreement. 1) It puts your financial future in your hands rather than in those of the state. Pre-nups allow you to determine your financial future in the event of a divorce, death, or the possible involvement of kids (in the post DINK world of course). 2) The process allows a couple to really delve into financial matters before marriage intertwines this even further. It gives a space to discuss financial priorities, current & future financial situations, possible scenarios for kids, debt, expenditures, goal making and so much more. 3) It offers the couple security in a number of ways, by: setting up expectations for the couple’s financial relationship, reducing discrepant views of finances that would likely result in conflict, allowing for equity with non-financial inputs (i.e. having kids or going back to school), and in the event of a split neither person is without the protection of having set up an equitable agreement to begin with. Timing. Discussing a pre-nup is never easy. It is best to bring up the subject even before you get to the gushy stages of an engagement. There are many important topics that a couple should discuss before considering marriage, and money is certainly one of them. Set aside some time to talk things out and educate yourself before making a decision one way or another. Not just for the wealthy. As was alluded to above, we’d recommend a pre-nup for anyone, whether or not you have money to worry about. While it isn’t romantic, marriage is about love, but it also means legally joining yourself in a financial sense. Even if you never get divorced, a pre-nup will help greatly in considering your values and discussing important issues around money before you get married. Mutual Agreement. Keep in mind that pre-nups often are discussed as if one person is walking away with all of the money and leaving the other with less. Pre-nups are what you make them to be. Ideally this means that both partners are protected, and you are able to establish how you will manage money early on. Resources. The best resource that we found on the subject (far more valuable and less costly than our lawyers advice) was the book “What to Do before I Do“, by Nihara K. Choudhri. This covers many different scenarios and allows a couple to decide if a pre-nup is right for them. This was an invaluable resource that I highly recommend. While getting into some of the details certain took some effort, we both found it worth while in the end. So as you can imagine, we are pretty big advocates for doing a pre-nup. Here are the details of how we did it, for our curious readers. Getting Educated. Miel picked up What to Do Before I Do at the Barnes&Noble in Georgetown and set out to learn more about pre-nups. She learned way more from the book, listed above, than she did from her lawyer, also better value than the lawyer. This was essential as she was prepared for this meeting and was able to tell the lawyer what she wanted. Getting Things Sorted Out. Then we sat down and discussed out what worked for each of us. This took a bit, but was easier since we were both interested in having one. Getting Lawyers. James already had a lawyer, and Miel got one for this purpose and then switched back to using James’ afterwards. On a side note, the lawyer of course tried to charge her and hour for a two line email that was received, but she managed to get that taken off the bill. The Details. So for the curious at mind, the basic details of our pre-nup go something like this. Both of our premarital assets are separate, as are any kind of inheritance. Within the first five years (when marriages are most likely to fail), the scale is tipped heavily in Miel’s favor. Because of the fact that James was going back to school and we knew it was likely that she would largely be supporting the household during that period of time. During this first five year, Miel would get 65% of post-marital assets and James would get 35%. Since he came into the marriage with a rental property and a chunk in retirement, he would manage alright, as would Miel. This helps to protect against James coming out of having been supported through grad school and then have a mid-life crises and possibly leave the relationship. He still says he has no intention or interest in this, but it is still good to be protected. Other details is that there would not be any alimony, going either direction. Lastly, the agreement is to be renegotiated after five years to discuss where we are at and add in additional clauses that make sense for our financial situation at that time. This will likely include things about life insurance, the possibility of kids, and so forth. Backgrounds. Some of the details around our pre-nup definitely stem from our past experiences. For James it was really important that he not pay alimony. He had seen his dad pay out alimony to his stepmom and didn’t want to have to deal with this. For Miel, she had seen her mom put her first husband through college on the promise that afterwards she would have her chance, that ultimately didn’t happen. So for her it was important that James not rely on her through school and then have things fall apart. Overall it was important for both of us to feel protected in the event things didn’t work out as we’ve envisioned. Post-Nuptial Agreements. Also keep in mind that if you don’t have a prenuptiaul agreement, or even if you do, you can still make agreements about money after marriage. Obviously this is likely to take a bit more negotiation, since both partners have to agree, but it can make a lot of sense in many situations. For instance, say if it looks like it might be better to have one partner take time off to raise kids. It would be very advantage to have an agreement before you quite your job on how finances would be divided and what your plans were over the long term for going back to work. Obviously all couples are different, but this might help to make both feel more secure and both be on the same page in terms of expectations. Keep in mind that this can work both ways. For instance, most likely the partner staying home would not get as good of a deal financial. At the same time, the spouse who is still working may have some expectation on how long the couple wants to stay on a single income. Working this out in advance, and legally, can help to protect and also make sure that expectations are in alignment. Here are some additional thoughts on doing prenups. While most commonly we think of disastrous examples of divorce among the fabulously wealthy, there are occasions where billionaires keep it real. At three years into our marriage we are glad to see that our marriage is as strong as ever.